If you're heading out for a picnic this summer, you don't have to restrict the treats to your picnic hamper! How about popping some Dolly Mix around your wrist, a pair of strawberries on your ears and a Custard Cream around your neck? Don't worry - I've not lost the plot or been in the sun too long without a hat - I'm simply appreciating the work of jewellery designer Elizabeth Dyer of Feel More Love Boutique. A master in the art of Polymer clay, Elizabeth creates these fun pieces of jewellery that would be perfect for picnics, festivals and parties! Above: One of these things is not like the others... Custard Cream necklace from FeelMoreLoveBoutique. Elizabeth was kind enough to send Lily in the Labyrinth a couple of items to review. 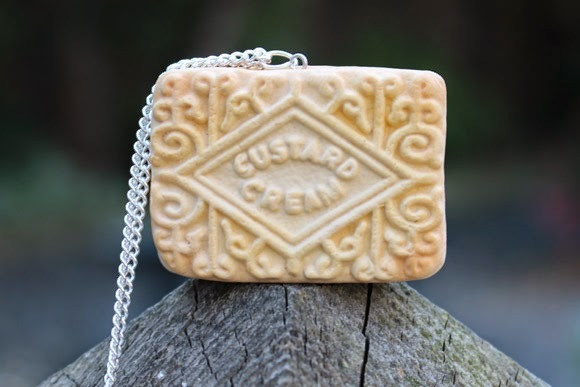 Firstly, the fun Custard Cream necklace. I was impressed upon receiving it to see how detailed the item was! 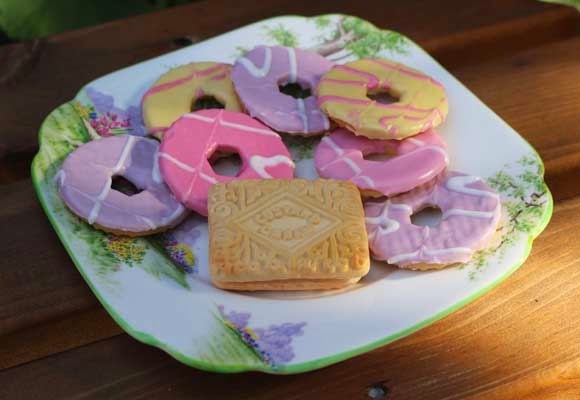 If it weren't for the silver chain protruding from the top-centre of the piece, you could easily mistake it for a real biscuit! 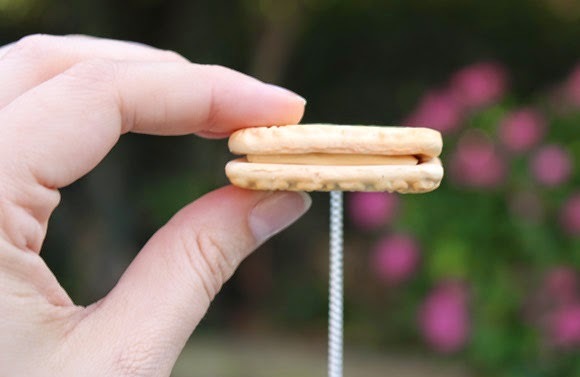 The same size as a real Custard Cream, the necklace has weight to it without being too heavy and sits on a silver plated link chain that falls mid-chest. Above: Amazing detail - you'd be hard pushed to tell this apart from a real Custard Cream! Elizabeth told Lily in the Labyrinth: "My work is inspired by pop culture and the world around me. 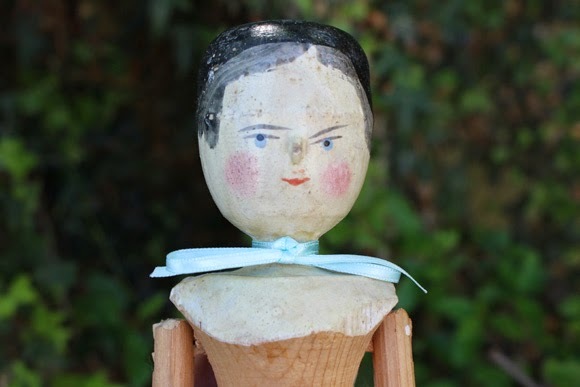 If it looks tasty and/or cute - I usually want to immortalise it in some way so that it can be worn forever. I am also inspired by Japanese culture and 'Kawaii'. I absolutely love all things miniature, so anything that I can scale down and make tiny is great! Most of my jewellery is made from polymer clay. It's a fab material to work with because it's very versatile and with a bit of patience, skill and knowledge, can literally be made into anything." Above: Side view - I've never been so tempted to eat Polymer clay! 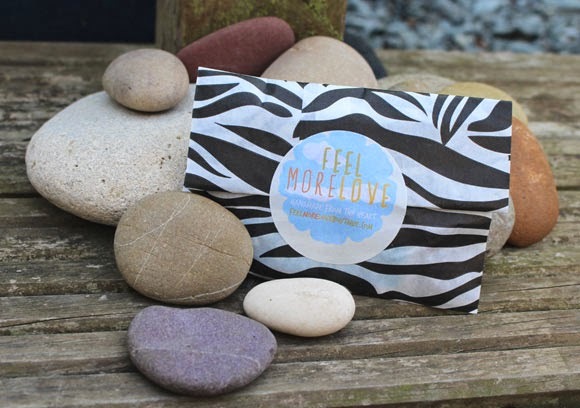 As well as the Polymer pieces, Feel More Love Boutique also stocks a range of other trinkets and treasures. 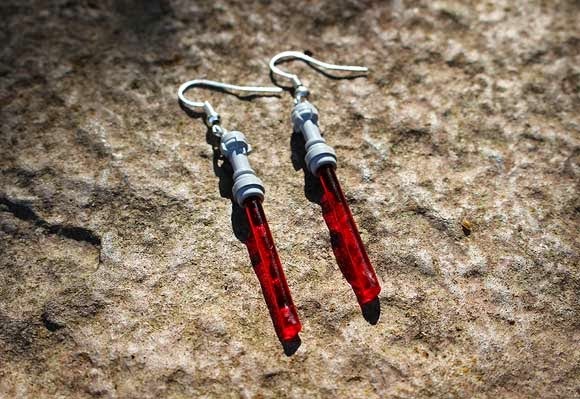 I particularly like these Lego Lightsaber earrings and can think of several sci-fi loving friends who would love to receive these as a gift! Above: Fun, Lego Lightsaber earrings which come in a range of colours. Aside from jewellery making and running her shop, Elizabeth also hosts workshops for those wishing to learn more about jewellery making and working with Polymer clay. I asked Elizabeth how she came to work so closely with colourful clay and set up Feel More Love: "Colourful, funky and unique objects have always been an interest of mine. As a child my mother made polymer clay miniatures for my Sylvanian Families to play with, so I have always been familiar with polymer clay as a material. I began using it to make my own jewellery just for myself, family and friends when I was at university in 2007/2008. I could never find the jewellery that I wanted to wear in high street shops, so I just started experimenting with clay. When I graduated from MA Fine Art in 2011 I opened a pop-up shop with a fashion designer friend (we ran it together for 6 months) selling our own art and design work, along with the work of other talented designers and crafters. It was then that I realised how popular my jewellery really was. When we closed the shop down and went our separate ways, I decided to open my own business - rather than a physical shop, an online shop - also attending and selling my work at fairs and festivals. 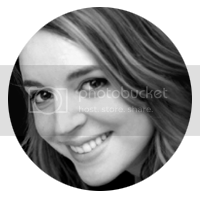 To add to this I run craft workshops and host jewellery making parties for people of all ages and abilities in Leicestershire and The Midlands." Thank you Elizabeth for these items :) Now I'm off to the shops as I have a rather large craving for a certain type of biscuit! Feel even more love! Follow the links . . . The custard cream had me fooled there! I'd love to try my hand at polymer clay some time.